A few large events issue collectibles or some sort of crypto-proof of attendance to their attendees. Famously, Piper Merriam issued a collectible to around half of the DevCon2 audience. 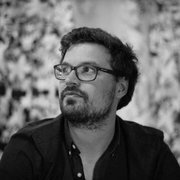 There is no simple solution for organizers to do this other than hand crafting an ERC 721 token, and the resulting tokens are incompatible with each other, hard to visualize in wallets and less interoperable than a conventional standard could be. We make it easy for event organizers to issue NFT attendance badges using several types of proof of attendance (more to be developed). 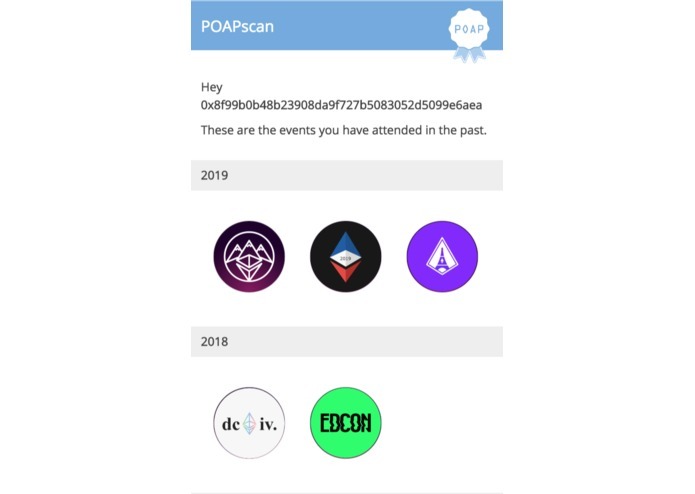 We built a version of POAP at ETHDenver a few weeks ago. 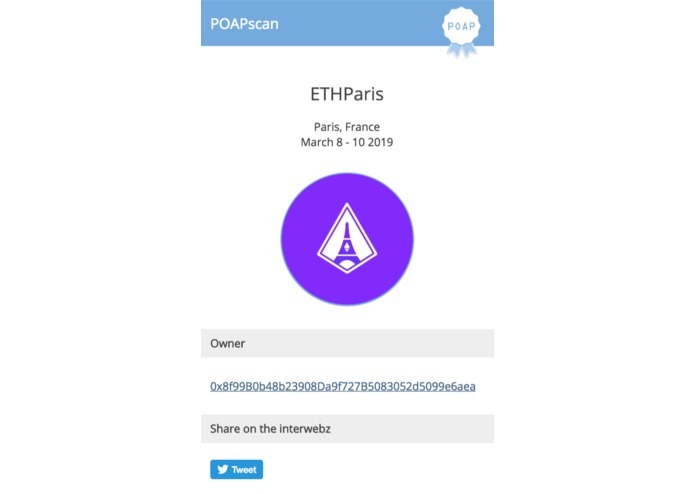 In ETHParis we worked on having a simple Vagrant image that can be set up by event organizers on any computer, which in turn runs a "claimer" Dapp that allows attendees to grab their tokens while they are at the venue without asking anyone for help. Proof of attendance is therefore obtained by the user having access to the local venue WiFi during the hackathon. Having a cross-wallet Dapp feels a little bit like writing webapps in the IE5 days. Event LAN/WiFi is always a treat to deal with. Even in the presence of an ocean of Mac desktops, keeping one running with your server on it for more than a few hours seems impossible. We issued a ton of badges to people in Denver, EthCC and ETHParis (and some of them even successfully used our self claim interface here). Cross wallet dapps are hard. Hopefully we get the visibility and engagement we want for event organizers to start adopting the tool! We think this can help a lot more users get started with NFTs which in turn creates incentives for better tooling and app usability around them.